My six year old niece has been requesting me to make doughnut ever since she saw that I purchased a doughnut pan a couple of months ago. She helped me with another post, Doughnut Muffins but she still wanted doughnuts and wants pink ones, meaning strawberry. This post I have three helper, my niece and my two nephews. They all love doughnuts, there is somewhat "tradition", when they go to the store they get a doughnut. I as well love doughnuts but they don't love me back. 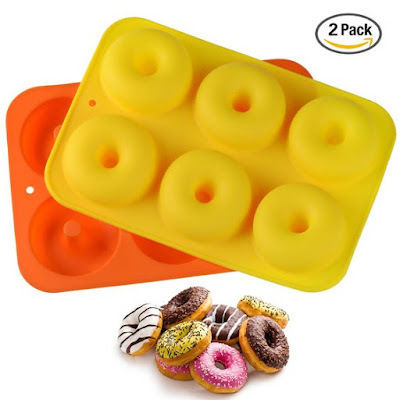 I purchased this pan back in June, it is Hestya Silicon Doughnut Pan with 6 cavities and it comes with a pack of 2 letting you making a dozen doughnuts at a time. There are made from food grade silicon, BPA-Free, dishwasher safe, oven safe, and microwave safe. Today, I am making two different kinds of buttermilk doughnuts with the same cake doughnut base. Vanilla and Chocolate. In a large bowl, combine oil, sugar, baking soda and baking powder. Whisk together. Add flour to oil mixture one cup at a time, then add buttermilk and eggs. Split and scrape vanilla bean and add to the batter. Divide batter into half. Add cocoa powder and chips to one of the batters. Cover and chill for 1 to 1 1/2 hours. Preheat oven to 375 degrees. Pour batter into a two ziplock bags. Spray pans with nonstick spray. If you are using silicon pans, place pans onto cookie sheets. Squeeze batter into each mold a 1/2 way full. Bake for 15 minutes, rotating the pan after 10 minutes then baking for another 5 minutes. Stick toothpick for doneness, if the toothpick comes out clean they are done. Let the doughnut cool in the pan on a wired rack for 20 minutes. Release from molds and let them cool on the same wired racks completely before glazing. Sift powder into two different bowls. Mash thawed strawberries with mesh strainer until all the juice is out of the strawberries, it will equal out to be 2 to 3 tablespoons of juice. Whisk together and set aside. Add milk to the other powder sugar and whisk together. Dip doughnuts into glaze and set back onto wired rack. Let the glaze set for at least 30 minutes before consuming. Store in a dry place. This looks so yummy! I'll give them a go! Thanks for the recipe! These look really tasty! Especially the glazed ones! I've always wanted to try making donuts but haven't ventured into that neck of the baking world just yet! These look really good! I bought a doughnut pan a few years ago because of all the good doughnut recipes I saw on Pinterest. I'll have to try this one! YUM! I'd love to make these one day! OH YUM. These look awesome!!!! oh i looove this! I'm tempted to run to the store right now and get the ingredients. Can't wait to try it. I don't have an oven. I just got married last year and before the marriage, I didn't like cooking. After marriage, I started to cook and this is a goal for me. I feel like your niece wanting to eat the strawberry doughnut. Oh those look heavenly. Thank you for sharing! Those look good. Do they taste like a cake doughnut? Yes they do taste like cake doughnuts. Homemade doughnuts in my hosue are daaannnnnggerous! They will not last long. Cute pans! These doughnuts look simply irresistible! I definitely prefer the cakey sort and the buttermilk must lend a wonderful tang and moistness to the doughnuts. I bet they went fast! Oh man, I love making homemade doughnuts. You just can't beat the flavor, and there's nothing like a doughnut while it is still warm. Yum! Man those look mouthwatering! No you have me craving donuts! Girl those donuts look freaking amazing! I have to save this recipe and try it!